This is just a reminder that our church supports online giving as a quick, easy way to maintain your stewardship commitment weekly, monthly, or yearly. Donations may also be made to the Memorial Fund as well as other dedicated funds supported by PICC. 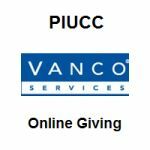 Simply click on the Vanco icon in the right column under Donations at the top of the home page. It will take you directly to Vanco to set up your account.